A lot of folks do a translation exercise with Beowulf. If I remember correctly, the old Scott, Foresman books I used in high school had one. This ReadWriteThink lesson plan looks like a good one. I created one for my own students, and I thought I’d share it here. This translation exercise examines one of my favorite parts of the poem: the scene when Beowulf rips Grendel’s arm off. I took four translations done by Michael Alexander, Seamus Heaney, Kevin Crossley-Holland, and Constance Hieatt. The last is a prose translation. I found all of these translations at BeowulfTranslations.net. After examining the translations, students will answer the questions on the second page (I refer on the handout to pages on the reverse because I always make double-sided copies when I can). The excerpts in our particular texbook, Prentice Hall’s Timeless Voices, Timeless Themes: The British Tradition (also true of their new Penguin edition, though pages differ) are from the Burton Raffel translation. This is most likely because the Raffel translation is published by Signet, who is owned by Penguin-Putnam. I’m not sure of the exact relationship between Penguin and Prentice Hall, but there appears to be some sort of understanding. If readers know, feel free to chime in. Compare the translations. What are the major differences that you see? The major similarities? Burton Raffel translated the version in your textbook (p. 48, lines 381-393) in 1963. Compare this version with the others on the reverse. Which translation do you think is most interesting/exciting/easy to understand/appealing? What Anglo-Saxon literary devices that we’ve studied (kennings, caesuras, alliteration) appear? In which versions are these devices preserved? Which Anglo-Saxon literary devices don’t seem to translate well—in other words, they don’t appear to be easy for translators to work into their versions of Beowulf? Speculate: why do you think this might be? 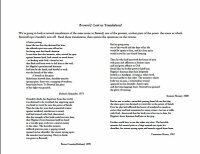 I included one prose translation of Beowulf, though many more exist. How do you think a prose translation differs from a poetic one? What qualities might be compromised in a prose translation? What conclusions can you draw about the process of translation? I freely admit an affinity for the Heaney translation, but I think others make a more poetic statement with this particular passage. I am not a huge fan of Raffel’s translation, despite having written a teacher’s guide for this version. What I hope students gain from this exercise is an understanding that translation is somewhat subjective. They may not be getting the most accurate, word-for-word version in modern English, and different translators focus on different elements. Like the ReadWriteThink lesson states, I want them to understand translations are rarely the literary works themselves so much as they are an “imaginative reconstruction” of these works. I also want them to think about the number of decisions translators must face. They are also available on the Handouts page. 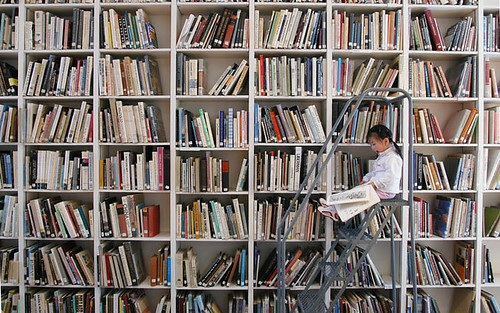 How do you decide what your students read? For many of us, which books we have available in the book room or which books are approved by the school system’s list may limit our choices. I had a conversation the other day with an English student teacher I know, and she was telling me of her frustrations that her college is pushing her to integrate YA lit into her lesson plans, while the school where she is student teaching is advising her to limit her selections to the book room. I remember taking a course in YA lit in college, and while I loved my professor, the venerable Dr. Agee, who has since retired from UGA, I was never able to use much of what I learned in the class in my high school teaching experience. NCTE also pushes YA lit, to the point of recommending (or they did when I was in college, anyway) books like From Hinton to Hamlet: Building Bridges Between Young Adult Literature and the Classics by Sarah K. Herz and Donald R. Gallo — a book whose purpose is to help teachers learn which YA books might be paired with classics already in the classroom. I actually really like YA lit. I am reading New Moon, the second book in Stephenie Meyer’s Twilight saga. I am a total Harry Potter nut. For my money, The Giver is one of the best dystopian novels I’ve ever read (I love dystopian novels, too), and the only part of teaching middle school that I really enjoyed was teaching The Giver. I don’t mean to discourage YA lit. I think the agenda of our education schools and NCTE is clear — let’s present our students with age-appropriate literature that will grab them. I agree that students should be encouraged to read YA lit, but I’m not sure that I agree we need to let it take over the high school curriculum, and I don’t agree with Teri Lesesne (in the article “Question for the Ages” below), who says that The Catcher in the Rye, The Scarlet Letter, and Beowulf are more appropriate in college. I have successfully taught all three books in high school, and I would even argue that Catcher is best suited for high school — the symbolism is easy, making it a great introduction to symbolism, and students around Holden’s age relate to him. If you have more research or articles on the use of YA lit in the high school classroom and/or selecting age-appropriate books for students, feel free to share in the comments. English teachers, here’s one to pass on to your students. In celebration of his blog’s seventh birthday (quite impressive! ), Neil Gaiman is going to post one of his books online for free for a month. Readers vote on which book they want to see. It might be fun for book clubs or classrooms to participate in a literature circle or perhaps even create student blogs to discuss the book. I can see all kinds of exciting potential for literature studies. Literature circles would be great on Book Glutton! I love the proximity chat and annotation features. Caveats: the site is still in beta, and according to Sylvia (Classical Bookworm), only works in Firefox (though I admit I didn’t test the site in other browsers, nor could I find information on the site that states the site doesn’t work in other browsers — still, I thought it prudent to pass the warning along). 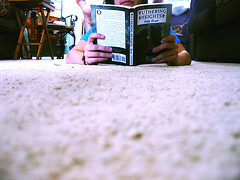 The first thing I wanted to do was dive in and form a reading group with my students. Social reading networks. I love Web 2.0.